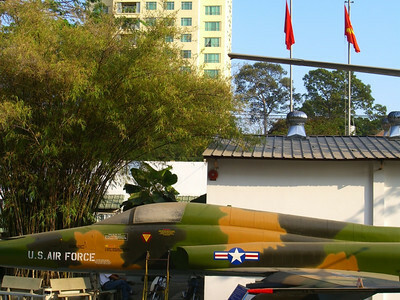 US military planes and tanks adorn the garden of the War Remnants Museum in HCMC. The exhibits here offer a sobering look into the horrors and aftermath of the Vietnam war, from the immediate loss of life and destruction of farmland to the effects still felt today of chemicals like Agent Orange that were used in the war. Read about our brief brush with the American (Vietnam) War. We were fortunate to be in HCMC right before the Vietnamese (and Chinese) lunar new year, welcoming the turn of the pig this time around. 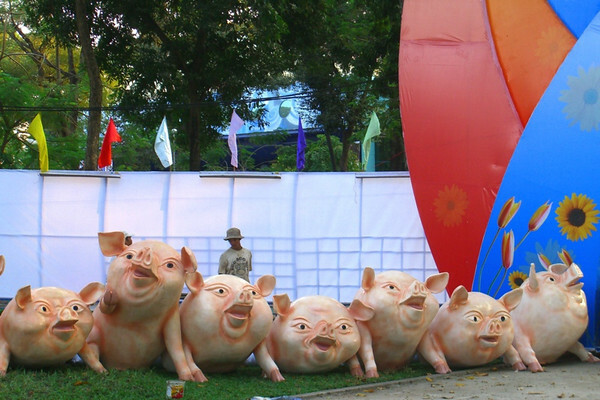 Pigs of all sizes and styles adorned the city, complementing the flowers and other new year decorations. 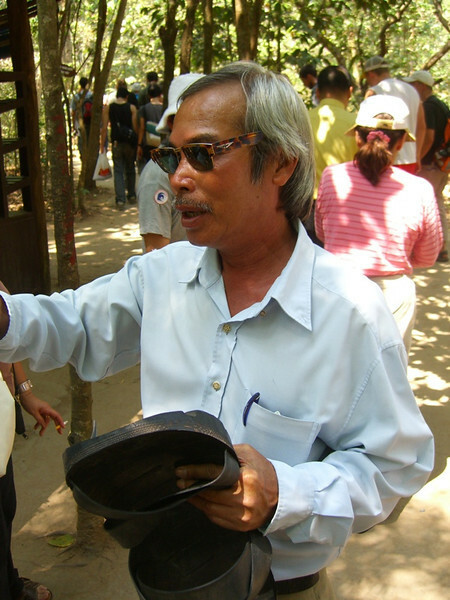 Read more about Saigon's preparation for Tet. 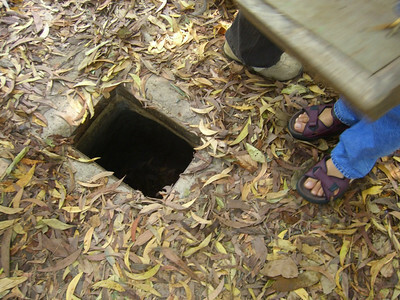 Located about 40 kilometers outside of Saigon, the Cu Chi region was the site of a 200 kilometer network of tunnels. These tunnels provided a way for people to navigate the area without being seen and to live underground. Tunnels were complete with living spaces including kitchens, bunkers, factories, clinics. This hole seen here is an example of a hidden entrance to the tunnels. Someone could drop down into the tunnel system to disappear or pop up above ground to lay a trap and then disappear again. Check out the size of the hole compared to the shoes. This gives an indication of how small the tunnels were. Even though a section of the tunnels was widened and to enable tourists to crawl through, the tunnel was still barely navigable and caused almost instant claustrophobia. We left with a greater understanding of how hellish it must have been for both sides fighting in this region (and in the whole of Vietnam). Of the 16,000 people original Cu Chi residents, only 4,000 remained at the conclusion of the war. Read about our brief brush with the American (Vietnam) War. 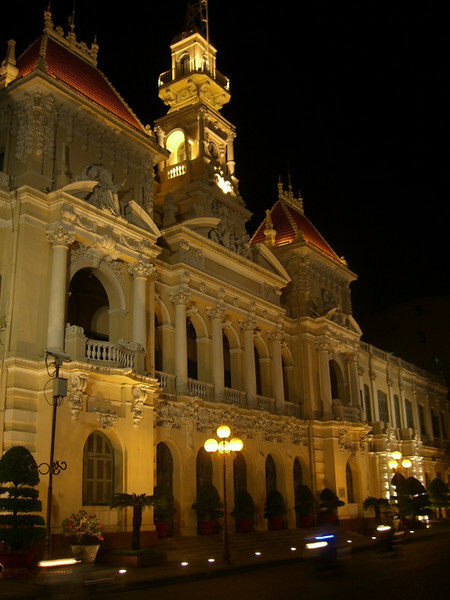 Built originally by the French, this perfectly preserved building houses HCMC's city hall (or People's Committee). 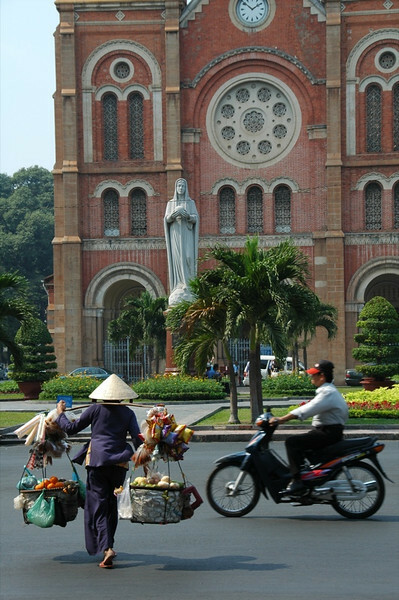 You can still see France's thumbprint in HCMC with buildings like this or the cathedral just a few blocks away. A bit of the west in the east. 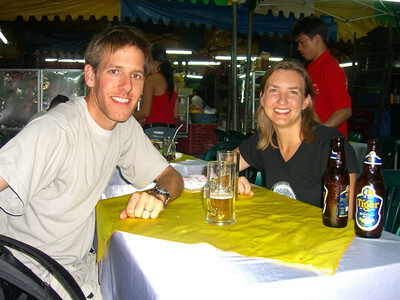 Read about our first impressions of Saigon. When the inside of Ben Thanh Market closes in the evening, restaurants set up outside under plastic tarps. 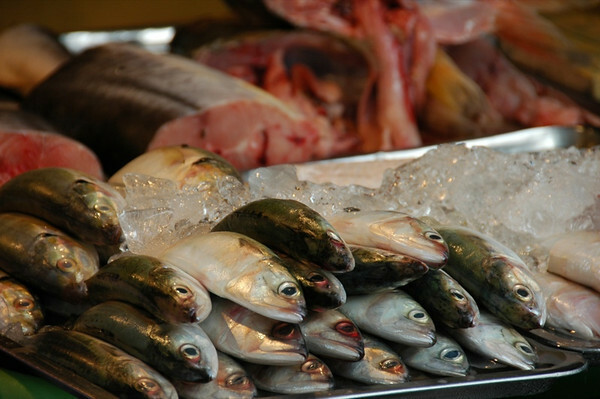 In a few minutes, the restaurant is ready - plastic tables, tanks of fresh seafood, a grilling and cooking area, and coolers of drinks on ice. We became regulars at this place, eating superbly grilled giant prawn of 350 grams, mollusks, oysters and soft-shelled crab for very reasonable prices. By the end of the week, we even had a regular table and got big smiles each time we entered. Read about snackin' in Saigon. Our whacky tour guide holds up a gigantic shoe as an example of the work done in the underground bunkers to keep people clothed, shoed and fed. Our tour began with a North Vietnamese propaganda film praising the courage and industriousness of the Cu Chi fighters. Another example of a tour where you learned more from what was *not* said. Read about our brief brush with the American (Vietnam) War. More fish than you can shake a stick at. Read about snackin' in Saigon. Sounds gross, we know. Absolutely not. The recommendation came from the waitress at our favorite sidewalk restaurant outside of Ben Thanh market. And inquiring minds wanted to know...or at least try. The taste more than exceeded our expectations - grilled mollusks (blood arca) that were buttery and clean, topped with roasted peanuts, spring onions, vinegar sauce and fresh herbs. 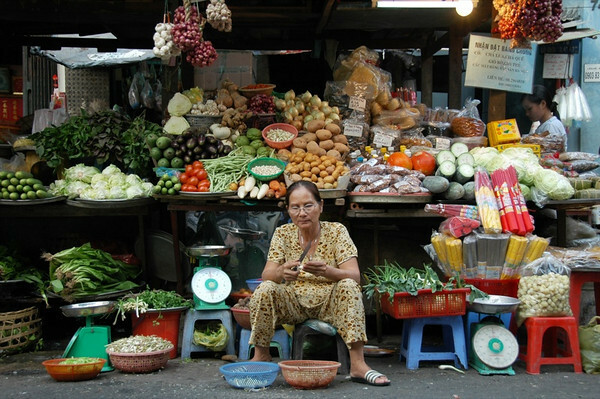 Read about snackin' in Saigon. Read about snackin' in Saigon. 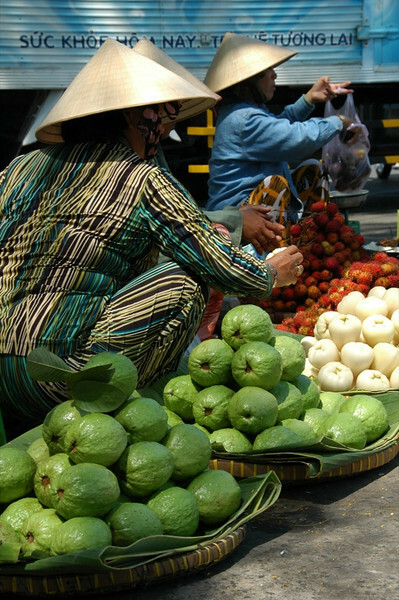 These women sell baskets of fruit outside the Ben Thanh market. We were spoiled with the choice of fruit and other foods on offer. 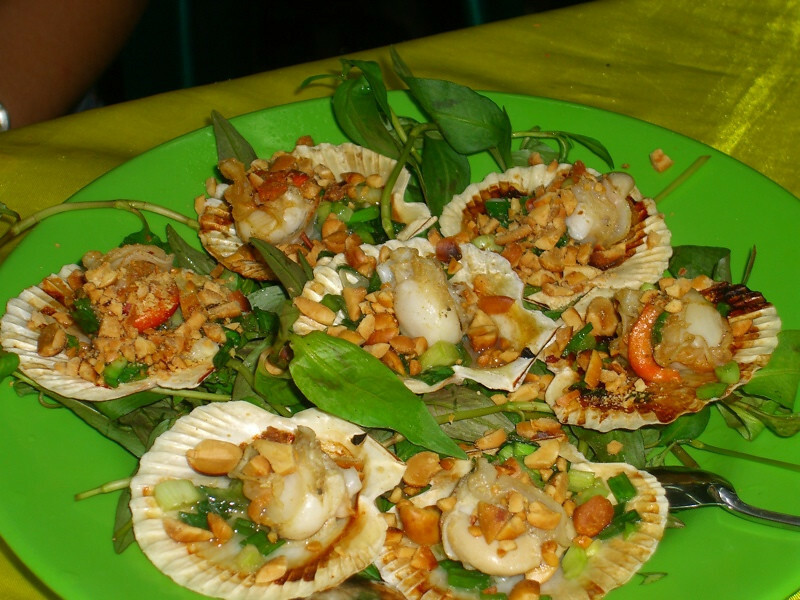 Read about snackin' in Saigon. Built in the last part of the 19th century by the French, this church has been nicely renovated recently. Read about snackin' in Saigon. 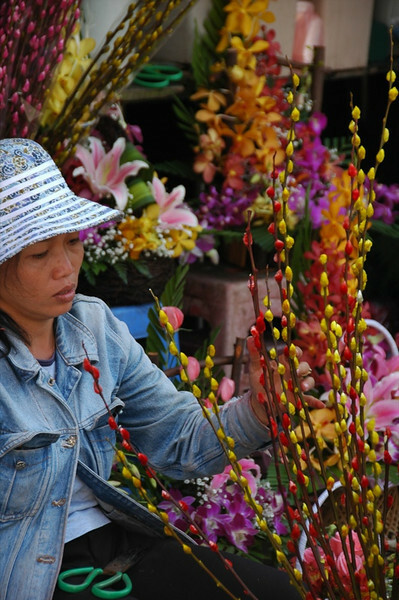 A flower arranger preparing for Tet. The amount of flowers and markets devoted exclusively to them rocket in the few days preceding Tet. Read about Tet festivities in Saigon. 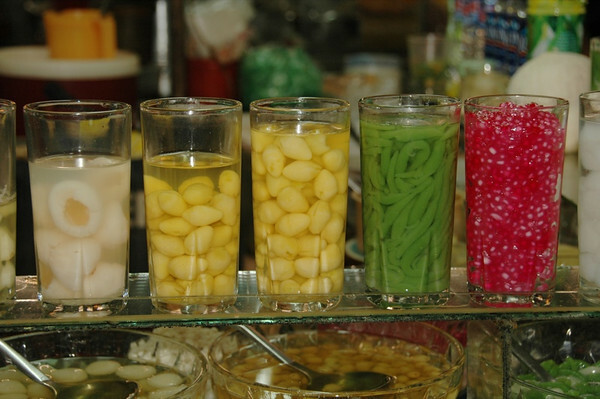 Che, a sweet, layered Vietnamese drink (or soup) served as a snack or dessert. And, it's all about choices and texture. A che stand will look something like a penny candy store. Do I want the red bubbles or the blue bubbles? Do I want mung beans or kidney beans? Out of fascination, Dan got into the habit of ordering these drinks at the Vietnamese market in Prague's Malesice district. Read about snackin' in Saigon. 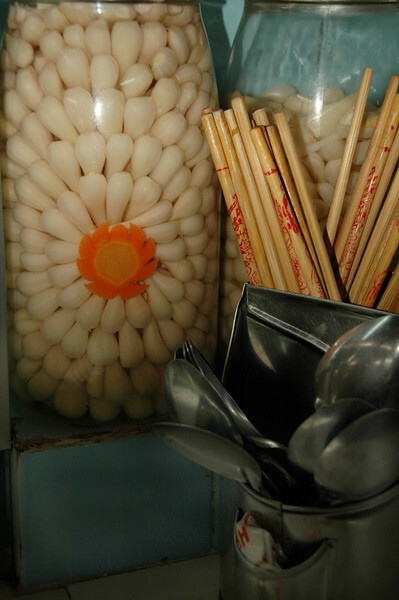 Pickled garlic and chopsticks at the Ben Thanh market in HCMC. Read about snackin' in Saigon. 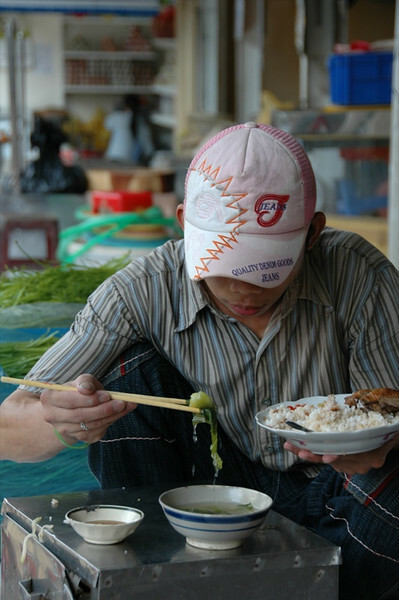 A seafood vendor takes a lunch break, eating soup with a side of rice. Read about snackin' in Saigon. 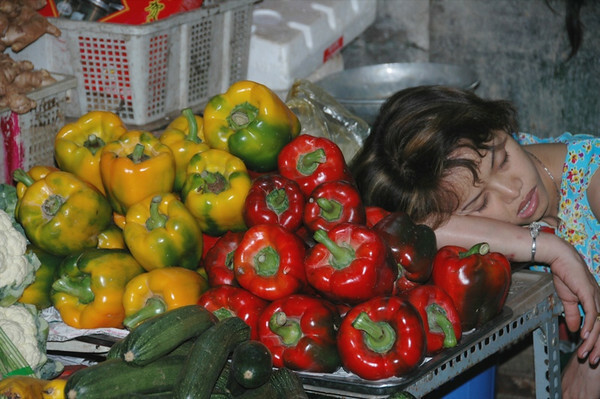 A vendor takes a post-lunch nap (or rather, the nap takes her) at a vegetable stand in Ben Thanh market. Read about snackin' in Saigon. 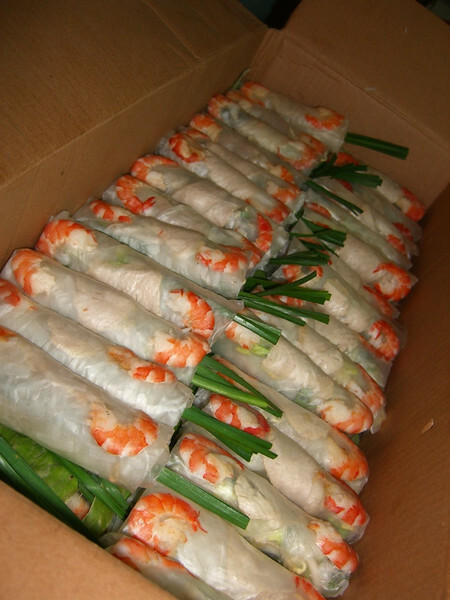 Hand rolled to perfection, these beautiful shrimp fresh spring rolls are part of a bulk order from a small stand at Ben Thanh market. We started rolling our own fresh spring rolls while still in Prague, thanks to the ingredients we were able to acquire at the Vietnamese markets. You can imagine our delight when finding them all over Vietnam. The more herbs rolled, the better. It makes an ideal savory snack - clean and healthy. Read about snackin' in Saigon. 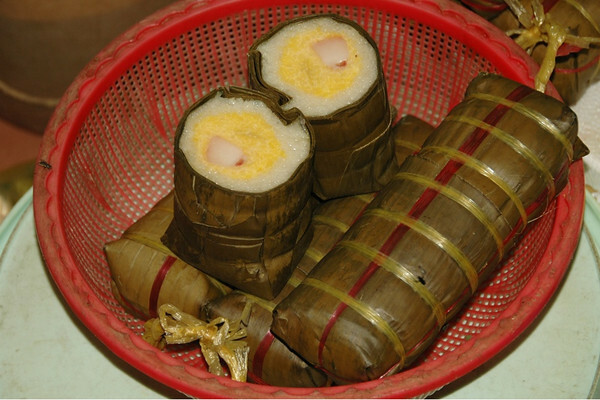 Banh Chung - sticky rice and pork wrapped tightly in leaves - are a must for welcoming in the New Year. Read about snackin' in Saigon. The week before Vietnamese New Year (Tet) brought a gigantic flower market to the park near our hotel. 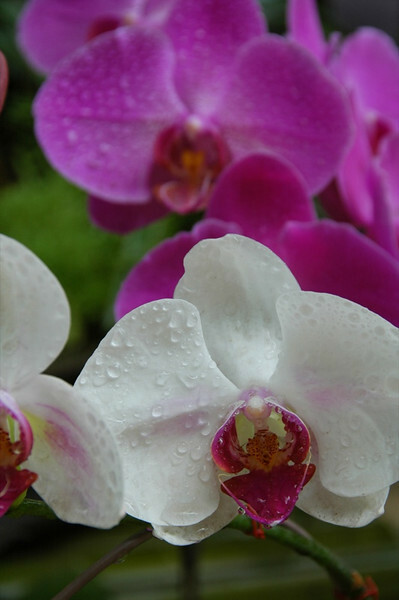 Flowers are essential to celebrating and welcoming in the new year. 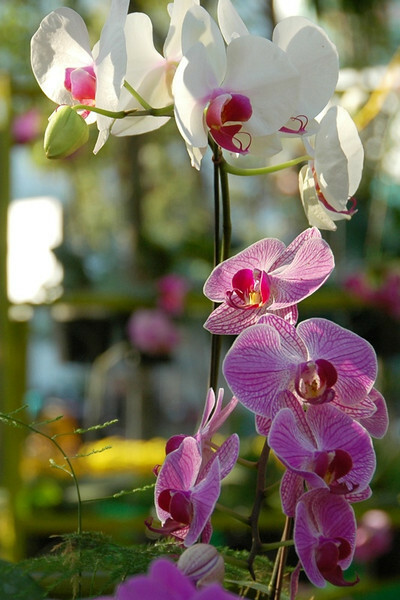 These orchids were just screaming out to be bought - how could you have a bad year with these in your house? Read about Tet festivities in Saigon. Read about Tet festivities in Saigon.